Dana Canedy, formerly a senior editor at the New York Times and a Pulitzer Prize recipient, served as Pulitzer administrator for the second year in a row. 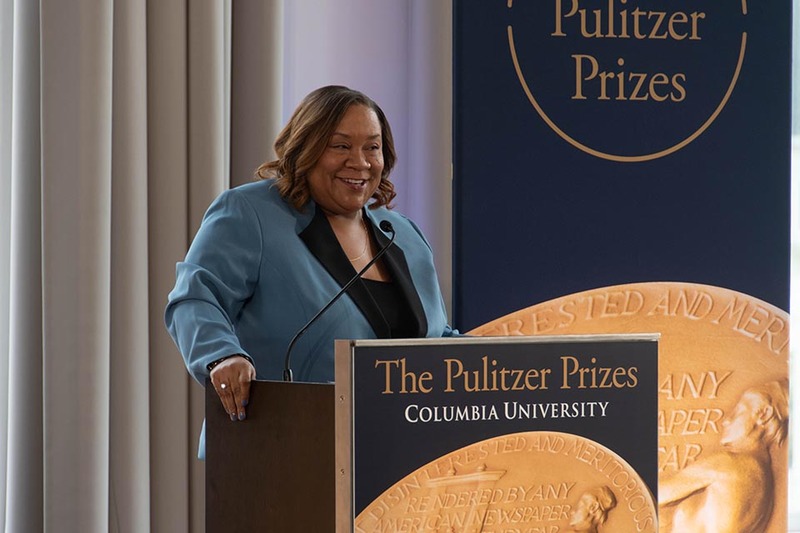 The recipients of the 2019 Pulitzer Prizes—the highest awards for excellence in achievements in journalism, literature, and musical composition—were announced by Dana Canedy, the administrator of the Pulitzer Prizes, on Monday at the Journalism School. Winners and finalists included a number of Columbia alumni, including Harriet Ryan, CC ’96 and former editor for Spectator; Caroline Weber, a Barnard professor; and five other Journalism School alumni. Canedy, formerly a senior editor at the New York Times and a Pulitzer Prize recipient, served as Pulitzer administrator for the second year in a row, after becoming the first woman, the youngest person, and the first person of color to hold the title last year. The prizes were first awarded in 1917 thanks to an endowment left by Joseph Pulitzer. Before the official awards were announced, Canedy commended the Eagle Eye student newspaper at Marjory Stoneman Douglas High School in Parkland, Florida for its coverage of the aftermath of the mass shooting at its school. The high school paper had submitted the obituaries of 17 classmates and staff members killed at the mass shooting last February. Canedy referenced the power of student journalism several times during the ceremony. “These budding journalists remind us of the media’s unwavering commitment to bearing witness even in the most heart-wrenching of circumstances, and service the nation whose very existence depends on a free and dedicated press,” Canedy said. Canedy reiterated this hope in an address to student journalists—in high school, college, and graduate school—in the room during the question-and-answer session following the awards. “One of the great things for all the students in the room to know is that it’s a more hopeful time than ever to be a journalist. You guys get to decide what the future looks like. There are students who are going to be sitting here five years from now asking questions about stuff that doesn’t even exist yet,” Canedy said. The South Florida Sun Sentinel won the gold-medalled Pulitzer Prize for public service for its coverage of the Parkland shooting. Canedy also praised the dedication of the journalists at the Capital Gazette in Annapolis, Maryland, where last June a gunman shot and killed five employees. The Pulitzer Prize board awarded the Capital Gazette a special citation, as well as $100,000 to support the newspaper’s journalistic mission. Sixty three professional journalists were killed in 2018 according to Reporters Without Borders. Ryan, along with Matt Hamilton and Paul Pringle of the Los Angeles Times, won the Pulitzer Prize for investigative reporting for their exposeé of the widespread sexual abuse perpetrated by Univerity of Southern California gynecologist George Tyndall. Carlos Lozada, former Knight-Bagehot Fellow in Business and Economics Journalism at the Journalism School, won the Pulitzer Prize for criticism for essays ranging across politics, immigration, national security, and feminist analysis. Aretha Franklin, who passed away in August, was awarded a special posthumous citation for her contribution to American music and culture. Alumni finalists include Kathleen McGrory, Journalism ’06, in investigative reporting, and Wendy Ruderman, Journalism ’97 in local reporting. Kyra Gurney, Journalism ’16; Nicholas Nehamas, Journalism ’14; and Jim Wyss, Journalism ’09, were finalists in exploratory reporting. Barnard professor of French and comparative literature Caroline Weber was a finalist in biography, and Aaron Glantz, recipient of the Dart Center Ochberg Fellowship at the Journalism School, was a finalist in explanatory reporting. p r i s m by Ellen Reid, premiered by the Los Angeles Opera on Nov. 29, 2018.